Posted July 16, 2010 in kinetics. Kirby has said on several occasions that he identifies with the Thing, the grumpy orange skinned monster he co-created with Stan Lee in the first issue of the Fantastic Four. The son of Austrian Jewish immigrants, Kirby grew up on the mean streets of New York’s lower east side. The area was teeming with rival street gangs, and as the artist details in his Street Code comic, he fought nearly every day to survive. Just how much anger Kirby carried inside him is difficult to tell, but he certainly channeled it into his vital and energetic artwork. In 1933, a film appeared that must have exploded like a rush of primordial energy in the impressionable brain of the then sixteen old Kirby. The impact of King Kong is difficult to appreciate today, but suffice it to say that nothing like it had ever been seen before. The cutting edge technology of stop motion animation allowed the filmmakers to create the illusion of a gargantuan creature in a primeval lost world and then see him transported to 20th century New York City. 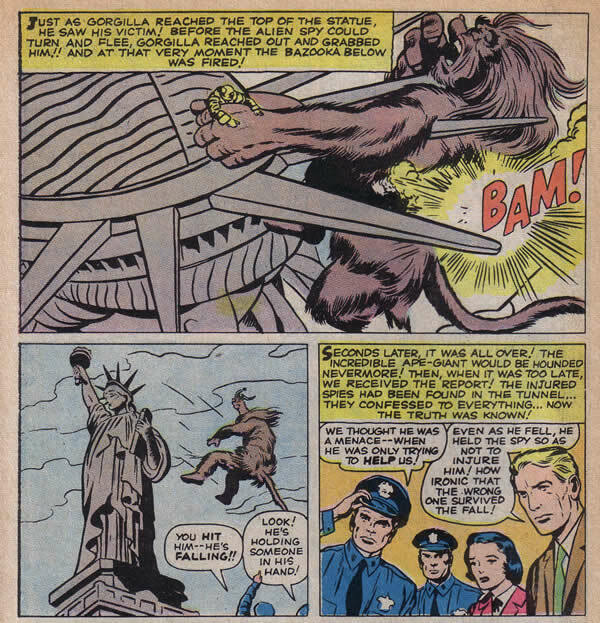 King Kong has been analyzed extensively, yielding interpretations running the gamut from a metaphor for the subjugation of man’s primitive instincts to that of the enslavement of African Americans. What is certain is that Kong’s treatment at the hands of a callous humanity makes him an extremely sympathetic and tragic figure and it is easy to identify with his plight.